A picture says a thousand words. That’s why the Health and Environment Alliance (HEAL) partnered with TEDX – The Endocrine Disruption Exchange, Science Communication Network, and a team of advisors in the US and Europe, to reduce complex scientific concepts surrounding endocrine disruptors into simple, accurate, and compelling illustrations. Endocrine disrupting chemicals (EDCs), also known as hormone disruptors, are chemicals that interfere with the natural hormones in our bodies. We are all exposed to EDCs in our daily lives, for example in some food packaging, pesticides, cleaning products, and cosmetics. 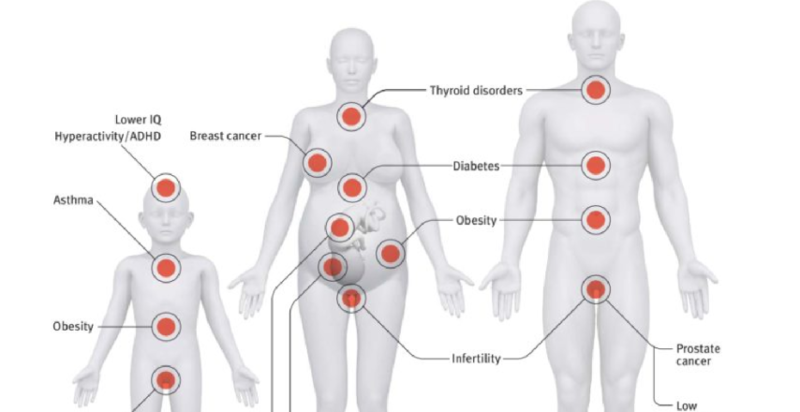 Over 1,400 chemicals have been listed as potential endocrine disruptors. Decades of peer-reviewed research has shown significant associations between EDCs – even in low doses – and adverse health effects such as cancers, fertility problems, obesity and some learning disabilities. EDCs can have severe negative effects on the hormone system of even unborn babies. Low Doses Matter, our first in a series of three, depicts the connection between exposure to low concentrations of common EDCs, and chronic health problems that plague the modern world.